What can one say about Avevale? This tiny village rests in a natural bowl-shaped valley about eight miles from the town of Eltdown. The river Ave (not Avon) runs through it, emerging from a natural culvert halfway up Camber's Hill, being joined by a tributary which skirts the foot of Grimmans Hill, and passing underground again as it enters the Pretendwood. Three roads meet at the village square; one leads eastwards to Eltdown, one northwards to join the main road to London, and one south-westwards by a winding course to the deserted village of Dowerton. The entire region is something of an anomaly, historically speaking, as technically it belongs to no county. The problem dates back to the Domesday Book, and the unfortunate discovery by its compilers that King William had in fact granted the same piece of land to three of his knights, each as sole chatelain. The monarch refused to allow the claimants to waste resources by fighting over it, but was not in a position to show favouritism to any one of them. Since none of them would take a fraction of what was already one of the smallest parcels to be handed out, William eventually flew into a passion and declared that, since it had given him so much trouble, he wanted no part of it either; and as far as is known, Avevale was left out not only of the Book but of all subsequent surveys and censuses till 1901. The alleged page of Domesday shown here is now known to be a forgery, probably the work of Genesius Elt (1658-1733). The three knights, Simon de Grivance, Bernard d'Elleton and one Alain (whose surname has not come down to us, but who may be supposed to have founded the Convulsion line), used the disputed land as a dumping ground for their younger sons, who, unhampered by feudal duty, set up their own manors and did very well in a modest way (the modesty to a certain extent enforced on them by the need to remain under the royal radar: just because William I had washed his hands of Avevale once did not mean he could not change his mind, and there was always his son and successor to consider). Fortunately, the royal eye remained resolutely turned away, though there was one hairy moment when disaster was only averted by young d'Elleton changing his name to Delt and disavowing all connection with his father, a pretence which then had to be maintained, to both parties' great distress, till the elder party passed away. The heraldic device of the d'Elleton family, azure a ferret proper saltant, nonetheless became known in later years as the sign of a popular and prosperous alehouse which stood by the village square and was much patronised by all and sundry. The proprietress was actually a member of the family, and the ale brewed and served by “Mistress Delt (or Dell)” became a byword for quality. She left no issue, and the inn passed into a succession of other hands before being renamed “The Man At Arms” in the early eighteen-hundreds, but the locals remember those days by means of a series of short comic plays which are still acted, if a little self-consciously, on the village green at Christmas, Easter and Harvest Festival. It is hoped to add transcripts of some of the plays to this site in due course. Avevale took no side in the Wars of the Roses. The priory of St Camber which had stood on the outskirts of the village since the eighth century was duly dissolved and looted during the Reformation, but no other attention was paid to the area. Cromwell is said to have passed through the village with his army on the way from south Wales to the north to deal with the Engagers, and some commentators speak of his having undergone some form of religious experience while camping in a field under Grimmans Hill. Certainly it was at about this time that he formed the firm conviction that he and his army were God's chosen instrument. After the Restoration, Genesius Elt, of whom we have already spoken, succeeded to the manor at an early age, and embarked on a career of fraud and deception. Among many other stories put about by this English Münchausen was the tale, inspired by the story of King Charles II and the oak tree near Boscobel House, that the fugitive monarch had actually hidden in several trees belonging to the Elt estate, on successive nights. As the story went the rounds, the number of trees grew in the telling, till it was popularly said that the King had made use of every single tree in the wood, which would have taken him, assuming one night per tree, several years. Inevitably the tale came to the ears of Charles II himself, who is reported to have exclaimed: “What the plague means the fellow? I never went near his poxy trees. That ferret will jump no more.” In the first known instance of royal intervention in the affairs of Avevale, the king confiscated the Elt estates and divided them equally between the families of Grievance and Convulsion, leaving Genesius only his house and a small garden. He is said to have accepted this with a good grace, but in his declining years he attempted to regain credibility by claiming, quite outrageously, that he had not meant to say it was King Charles who had occupied the trees, but the Old Pretender, or possibly the Young Pretender. It became clear that the only pretender involved here was Genesius himself, and the woods became derisively known as the Pretendwood, a name they bear to this day. The Elt line continued, in reduced circumstances. So, between Convulsion Hall and Grievance Grange, Avevale drowsed through the rest of the eighteenth and part of the nineteenth centuries. The Enclosure Acts had very little effect on it, the railways could not even get to it without a prohibitively costly reshaping of the surrounding landscape (the nearest station, at that time, being Dowerton), and the industrial revolution likewise passed it by, though the newly available products thereof were eagerly sought out by those who made their way to Eltdown market. The rich soil of the valley supported arable and livestock farming equally well, and the village never lacked the wherewithal to hold its own in trade with its neighbours. Around the end of the eighteenth century, Damian Elt, the last of the line, had returned from an archaeological expedition to the Middle East in high excitement. He had unearthed something, that much was clear; an ancient artifact of some kind, wrapped in what appeared to be a manuscript in Aramaic. The artifact, a nail of the kind used by the Romans in the crucifixion of criminals, was kept in his house in London, which eventually became the Club With A Nail In It. 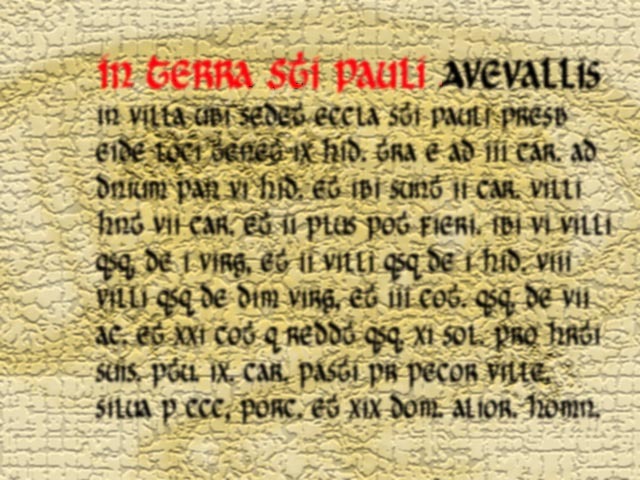 The manuscript was to become the basis of a new religion, or rather a new Christian schism, founded by Elt, and purporting to be based on the teachings of Christ uncontaminated by the influence of St. Paul, whom Elt saw as an agent of evil whose effect on the early church was to corrupt it and addict it to temporal wealth and power, an addiction that repeated revolutions and schisms throughout history had failed entirely to eradicate. Apaulism gained a sprinkling of members (dubbed “appallings” by the popular press of the day), but never achieved the success that Damian Elt had wished for it; however, like Avevale itself, being so small, it escaped the notice of the established churches, and continues in existence to this day. Its headquarters, and in fact its only meeting place, is the church of Without Saint Paul (a punning name given it by Elt himself) which stands on Camber's Hill, beside the road that leads out of Avevale and passes the gates of what used to be Convulsion Hall. The Convulsion line, sadly, came to an end in the early part of the last century with the death in La Paz, at a great age, of Lady Violata Convulsion, who had not inhabited the Hall for many years. In her will she bequeathed the entire estate, still quite substantial, to a consortium of explorers, scientists and academics who had taken to meeting at the Club With A Nail In It, with the direction that they use the money to establish an educational institution free from either state or faith-based control. This they did, and Avevale College thrives (in a small way, it hardly need be said) to this day. As for the Grievance family, Sir Louis Grievance, the latest scion of the line (all of whose first-born male members have been named Louis for at least three centuries), still lives at the Grange, dividing his time between there and the Club With A Nail In It, and overseeing village affairs with a paternal if somewhat bloodshot eye. Today, the village boasts gas, electricity, telephones, mains water and drainage, and some enterprising villagers even own television sets, though the terrestrial signal is poor in the valley; but no supermarket has attempted to encroach upon its high street, no factories fill its air and water with effluent, and no mobile phone masts adorn its buildings. The occasional hiker or cyclist may happen upon it unexpectedly, stay for a day or two, and move on; it is not that they are not welcomed (the villagers are always pleased to see new faces and hear news of the outside world) but perhaps that they feel the presence of something that is better left to itself. Perhaps they feel the presence of the Gilchrist machine, whirling and muttering in its dome; or the last church of the Apaulines, lonely on its hill, guarding its secret; or something else, something that lurks perhaps in the dappled clearings and shadowed groves of the Pretendwood, or on the windswept summit of Grimmans Hill, or in the dark cellars of the inn that used to be called the Ticklish Ferret. Perhaps the secret goes back still further, to the time of the early Christians and the miracles of Saint Camber, whose priory was founded on the very spot where he reputedly tamed the mighty Worm of the Well; or yet further back, to the days of the Romans, when the story of the life-renewing Avevale Chalice (clearly a modified form of the Cauldron of Ceridwen) struck superstitious awe into the hearts of the doughty invaders. Or maybe it is Avevale itself, whose name contains both hail and farewell in the ancient Roman tongue, that so welcomes the coming and speeds the parting guest. One thing is certain. The end of the mysteries that surround this small, innocuous-seeming community has not yet been reached. Maybe it never will be.